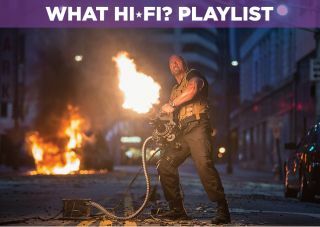 Fast & Furious 7 – Blu-ray review | What Hi-Fi? Vroom, vroom, bang! It’s a genre, even if there’s no such section in your local HMV. It’s the art of driving fast and blowing things up. You’d think anyone could to it with a multi-million-dollar budget and several barrels of gasoline, but it’s harder than it sounds. Just look at Michael Bay’s latest. Fast & Furious 7 may also have cool cars and a penchant for wrecking them in increasingly silly ways, but it has something the Transformers don’t: heart. There’s as much dramatic weight here as there is gunpowder. This instalment has Vin Diesel and friends hunting (while also being hunted by) an evil Jason Statham. We’re aware that makes no sense whatsoever, but it’s best to just roll with it. By now, the franchise has little to do with its roots. What started as a turbo-charged Point Break is now a live-action Looney Tunes. Set-pieces are more unhinged than ever, which is a tall order considering the vault-dragging chase of the fifth film and the tank fight of the sixth. Hundreds of vehicles were harmed in the making of these videos. Now we’re into jumping cars between skyscrapers, or flinging them out of planes at 12,000ft. That sure will start your engines. What that means for you is a majestic audio/visual buffet. There are all types of mayhem, and it all looks tremendous in 1080p. The transfer is clean, with crisp edge-definition and fine contrast. The DTS-HD Master Audio 7.1 soundtrack is just as thrilling. It’s an immersive experience with precise directional effects. There’s a shop full of thundering motors, and something is nearly always about to be smashed. Most important of all is the personal touch – a tenacious devotion to practical effects means minimal CGI. People were genuinely pushed about on top of moving cars. A real plane rained real cars from the sky. It looks good, of course, but it enhances the thrill too. The actors themselves are properly invested. It’s easy to care when there’s palpable chemistry, even if their lines are cornier than a tin of Green Giant. The late Paul Walker, who died before filming completed, had his scenes finished by his brothers. Their additions are seamless, and demonstrate the amount of care that has gone into making the film as polished as it is rambunctious. Vroom, vroom, bang! This is how you do it. The cool, crazy stuff is bound to get your pulse racing, but at the end you might just find a lump in your throat.